Two Lithuanian students at the University of Edinburgh have won a $10,000 prize at a global computer coding competition in Mumbai. School of Informatics students Marijonas Petrauskas and Karolis Greblikas were awarded joint first prize at CodeVita, one of the largest coding competitions in the world. 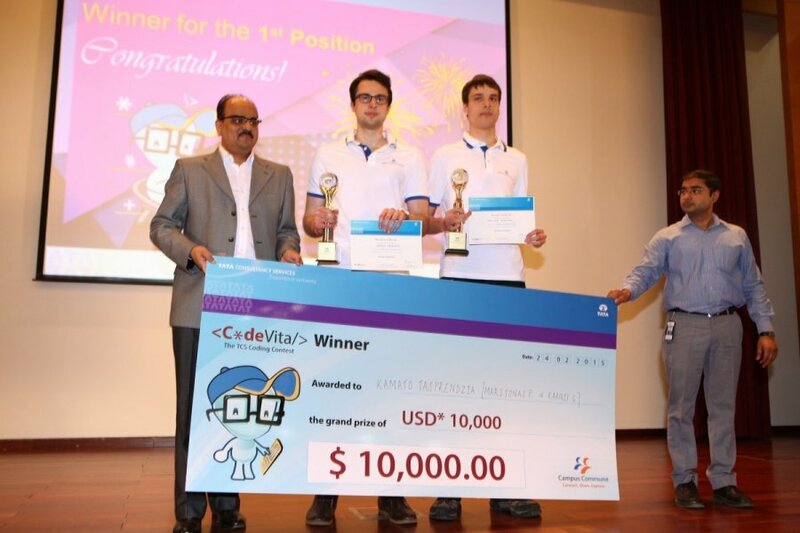 Marijonas, a fourth year computer science and electronics student and Karolis, a second year computer science student, also secured a paid internship with competition sponsors Tata Consultancy Services (TCS). Fifteen teams took part in the hard-fought final which lasted over six hours. Competitors were judged on their ability to solve coding problems and algorithms in a gaming environment. It tested their technical knowledge, ability to execute and implement computer code and their speed, agility and creativity. The final also included Edinburgh Informatics students Lukas Capkovic and Marko Puza and teams from India, Peru, USA and Canada. The coding challenge is one of the largest student competitions of its kind. Almost 50,000 teams from around the world took part. The Edinburgh pair were one of 14 teams who fought for the prize in Mumbai. Tata Consultancy Services is one of the world’s leading IT service groups and has more than 300,000 trained consultants in 46 countries. All computer browsers, social media platforms and phone apps are created using code. Coding involves writing instructions that a computer can understand and tell a system what to do.here. Competition winner Marijonas Petrauskas said: “It was an honour to represent the University of Edinburgh in the competition. Both of us have been participating in coding competitions for a number of years. The university has greatly contributed to our success at TCS CodeVita and we are very thankful for the support.